“Above and Beyond” is a moving and entertaining documentary about the young international volunteers who dashed to Israel in 1948 to create an Israeli Air Force. They were World War II vets from the U.S., South Africa, Britain and elsewhere. Most, but not all, were Jews, and virtually none could speak Hebrew. The only aircraft they could get their hands on were smuggled out of American scrapyards or obsolete, poorly-assembled German ME-109 fighter planes built in Czechoslovakia. They risked losing their lives and their citizenship in what most regarded as a hopeless, lost cause, fending off “a second Holocaust,” which newspapers and Arab leaders in Jordan, Egypt, Saudi Arabia, Syria and Iraq had threatened. “It was the dumbest thing I ever did,” one survivor says now, laughing. It wasn’t a lost cause, and although many died, the survivors remember it as “the greatest thing I ever did.” Many, like future screenwriter Harold Livingston (“Star Trek: The Motion Picture”), discovered their Jewishness through the experience. “It made me a mensch,” he quips in the film. Guys like Livingston, Lou Lenart, Coleman Goldstein and Gideon Lichtman may not have been able to find Palestine on a map. Most remember coping with American anti-Semitism, hiding their heritage and enduring their parents’ sniping that they weren’t observant “Good Jews.” But when Britain announced it was withdrawing from Palestine and the Arab world threatened to destroy the Jewish community there, its ranks swelled by the emptying of Europe’s concentration camps, they had to act. Roberta Grossman’s film is one-sided and triumphalist, to be sure. The expert witnesses here are all Israelis, Jewish academics and the like. This isn’t a movie that debates the sort of state Israel became or whose land it was founded on. “Above and Beyond” is a jaunty recollection of the clandestine means a handful of people used to raise money, buy aircraft and arms and recruit pilots, “going through (stolen) military records, looking for Jewish-sounding names” of ex-pilots and aircrew. Every time they got a taker, it was “meet Swifty” or some guy wearing a flower in his lapel on west 47th in Manhattan. 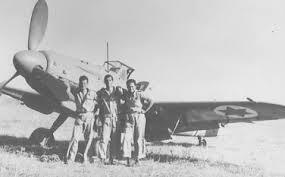 They formed a fake Panamanian airline, smuggled planes to Czechoslovakia and got their first look at the clumsily assembled German fighters many of them would take into combat. The guy proudly reading that comical yet “official” account? Rubenfeld’s son, Paul “Pee Wee Herman” Reubens. Cast: Harold Livingston, Lou Lenart, Paul Reubens, Gideon Lichtman, Coleman Goldstein. Credits: Directed by Roberta Grossman, screenplay by Sophie Sartain. An International Film Circuit release.